It’s one thing to study individual parts of your diet – does cholesterol cause heart disease? (No.) What about fat? (No.) What about salt? (No.) But eventually you start realizing that it’s not so much individual foods that cause the big-picture effects. It’s really your entire dietary pattern. Are you eating that delicious bacon in the context of a highly inflammatory diet full of junk food? Or are you eating it in the context of an anti-inflammatory diet rich in fruits and vegetables? The health effects of the bacon will depend on the answer, because context matters. That’s why it’s useful to have overall studies that look at Paleo as a big-picture dietary pattern. 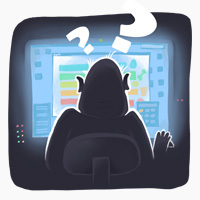 So here’s a look at some of the studies measuring exactly that – with explanations of exactly what kind of “Paleo” was used in the studies and their strengths and weaknesses, because “Paleo” can mean so many things that at this point that it really does need some specifying. As it turns out, several studies have been done on Paleo-type diets, with very encouraging results. 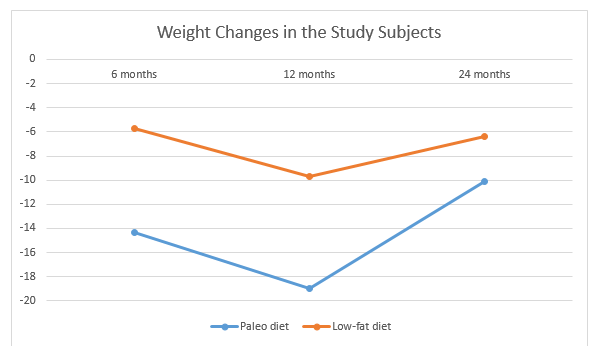 This study on a Paleo diet for weight loss is great because it’s relatively long-term. You can get study subjects to adhere to just about any random bizarre diet for a week (especially if they’re being paid to do it) and if they lose enough water weight, you’ll get some impressive numbers even if your diet is completely unsustainable. But this study is was relatively long-term (2 years), so it gives a good idea of how Paleo works in the long run. The study compared the effects of a Paleo diet to the effects of a standard low-fat diet on 70 obese postmenopausal women. Paleo was a high-protein, moderate-carb, low-ish-fat version of Paleo, “based on lean meat, fish, eggs, vegetables, fruits, berries, and nuts. Dairy products, cereals, added salt, and refined fats and sugar were excluded.” The diet was not very low-carb: the researchers didn’t include daily food logs, but given the reported amounts of carbohydrates eaten, it could have easily allowed for a few servings of starchy vegetables every day. Unfortunately, dietary adherence was pretty lousy in the Paleo group, which makes it hard to tell whether or not the diet as written would have worked. Specifically, none of the women ate the recommended amount of protein. But the results are still encouraging. At 6 months, the Paleo group lost 6.5 kilograms (14.3 pounds), and the low-fat group lost 2.6 (5.7 pounds). At 12 months, the Paleo group was down 8.7kg (19 pounds), and the low-fat dieters were down 4.4 (9.7 pounds). Both then regained some of that weight: at 24 months (2 years), the Paleo group was still down 4.6 (10.1 pounds), while the low-fat group was down 2.9 (6.4 pounds). The subjects in the Paleo group also had lower triglycerides. They didn’t show a significant increase in insulin sensitivity, but that was because they had normal insulin sensitivity at baseline. Paleo is more satiating per calorie than a standard “diabetes diet” or a Mediterranean diet. People eating a Paleo diet naturally reduce their calorie intake without actually counting calories. This study wasn’t actually focused on weight loss at all, but it includes this gem: “Despite efforts to keep bodyweight stable, it decreased in the Palaeolithic group compared to reference.” In other words, the researchers did everything they could to prevent their Paleo subjects from losing weight (including extra snacks), but they couldn’t do it: the Paleo group kept losing anyway. How’s that for effective? syndrome. It’s funny how actually addressing the problems causing weight gain instead of just treating the symptom of excess fat tends to treat these diseases as well! This study found that a Paleo diet was much better than a diet full of “heart-healthy whole grains” for improving cholesterol profiles in men and women (lower LDL and triglycerides; higher HDL). The subjects were 20 men and women with high cholesterol. First, they ate a heart-healthy diet for 4 months; then they ate a Paleo diet (“vegetables, lean animal protein, eggs, nuts, and fruit” with no calorie limit) for 4 months. The researchers measured their blood lipids at several points throughout the study. LDL cholesterol: LDL dropped very slightly during the AHA phase, but dramatically during the Paleo phase. Triglycerides: The AHA diet had no effect on triglycerides, but Paleo reduced them by almost half. HDL cholesterol: The AHA diet lowered HDL cholesterol, but Paleo raised it. (As far as we can tell from what we know about cholesterol, this is actually good). This study is interesting because it confirms what we already knew from shorter studies. It’s nice to see that Paleo is promising when subjects eat that way for 10 days, but it’s even better to see it working in a long-term study. This study lasted for only two weeks, but it did find that Paleo was more effective than a “healthy reference diet” (think whole grains and lots of low-fat dairy) for lowering blood pressure, total cholesterol, and triglycerides, while raising HDL cholesterol. 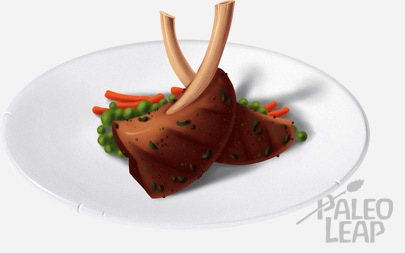 Paleo was “based on lean meat, fish, fruit, leafy and cruciferous vegetables, root vegetables, eggs and nuts. Dairy products, cereal grains, legumes, refined fats, extra salt and sugar were not part of it.” The study subjects were 36 men and women, age 54 on average. (This was the same study where the Paleo subjects lost weight even though the researchers tried to prevent it). This study that a Paleo-style diet improved markers of Type 2 diabetes in 13 patients compared to a standard diabetes diet. This one isn’t technically Paleo (it’s called the Spanish Ketogenic Mediterranean Diet), but it was a ketogenic diet based on olive oil, green vegetables, salads, and fish, with moderate red wine consumption – Paleo in everything but the name. And it had impressive effects on body weight, blood pressure, cholesterol, and blood sugar in 31 obese subjects. The studies we have are mostly done on a higher-protein, moderate-carb version of Paleo, but studies on a Paleo-style ketogenic diet show similar benefits. In all the studies that have been done so far, Paleo has either matched or outperformed the typical “healthy” carb-based, whole-grains type of dietary pattern; it’s especially well-studied for diabetes, cardiovascular health, and weight loss. In other words, it’s absolutely not true that there’s no evidence supporting a Paleo style of eating. It would be great to also get some evidence on a high-fat version of Paleo with lots of red meat: hopefully with the recent moves towards accepting saturated fat and cholesterol as perfectly healthy parts of the diet, those studies will be coming soon!